Finished in the rare color combination of Saddle Tan with a matching Saddle interior and top, this Corvette is a sight for sore eyes! The exterior is in excellent condition including all of the chrome, stainless, turn signal and side marker lenses. All window glass is clear and in good condition. The Saddle interior is in great shape and is in mostly original condition, including the vinyl bucket seats, door panels, dash cover and carpet. The fully functional gauges and their lenses are crystal clear and are highlighted by the original steering wheel. Features include factory heat and AM/FM radio too. Power comes from the recently refreshed 327 V8, 4 Speed transmission and Posi-traction rear end. The motor is not original to the car but is a period correct 300 HP motor with the correct heads, intake, and exhaust manifolds. White wall radials and knock off wheels round out the package as well. Driving this Vette is a blast! It starts quickly and runs through the gears crisply. The power brakes stop the car on a dime, and the power steering helps when maneuvering. Simply drop the top, turn on the tunes, and go for that well deserved Sunday cruise. This car was born and raised in sunny California, and it shows! Quality refinishing mixed with some originality make this 64 a great car for show and go. A through TLD detail has been performed to ensure that this Corvette meets our strict standards. Stop by our showroom to see how nice this Corvette really is, down to The Last Detail. Finished in proper Shelby livery, this Cobra speaks to the dominant racing history that follows these cars. The exterior of this MKIII features painted black stripes that are surrounded by the perfect shade of silver. Every curve of the body is highly polished and reflects its low mileage. All lenses, trim, and chrome work are in like new condition, including the windscreen. Inside the cockpit, a period style AC steering wheel sits in front of Smiths gauges and Lucas switches. Behind the drivers head is a single hoop roll bar, and just below are leather seats that look identical to the originals and feature a racing style lap belts. A soft top and side curtains are included as well. Opening the hood reveals a Roush Performance 327R, Ford small block that produces 425 horsepower and 390 pounds of torque! Balanced and blueprinted with aluminum heads, and forged internals, this motor is ready to go the distance. The Roush motor is nothing without the Tremec TKO 5 speed and Mcleod Racing clutch set up. Disc brakes and independent suspension at all four corners make sure that this Cobra handles anything you through at it too! A custom ordered exhaust is tucked under the car for a different look and sound too! These tribute cars possess all of the styling and performance of an original Cobra, but can be driven, raced and enjoyed for a fraction of the cost. In fact, the Superformance MKIII is the only Cobra replica built to such exacting standards that it is under license from Carroll Shelby Inc!! With just a little over 4100 miles on the clock, this garage kept Cobra is just getting broken in. Being previously owned by a predominant sports figure, excellent condition, and low miles makes this the car to own. A thorough detail has just been performed to make sure this car stands up to our strict standards, so give us a call to schedule a showing to see how nice this Cobra really is, down to the last detail! This 1962 Chevrolet Impala Bubbletop took home the 2015 Barrett-Jackson Cup “Ultimate Best in Show” award. RENO, Nev. – Aug 11, 2015 – Barrett-Jackson, The World’s Greatest Collector Car Auctions®, created a global stage for custom cars during the 3rd Annual Hot August Nights Auction presented by Barrett-Jackson in Reno, Nevada, on Aug. 6-8. 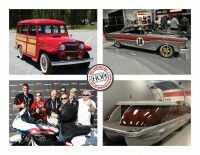 For the third year, the auction held the world’s most celebrated custom car competition, the Barrett-Jackson Cup. With over $100,000 in cash and prizes on the line, Randy and Lisa Wilcox took home “Best in Show” with their 1962 Chevrolet Impala Bubbletop. When Barrett-Jackson teamed up with Hot August Nights in 2013, the Barrett-Jackson Cup was born. With Cup sponsors including Eldorado Resort Casino, Silver Legacy Resort Casino, Harrah’s Hotel & Casino and Circus Circus Hotel & Casino, the Barrett-Jackson Cup boasts the largest prize purse of any American custom car competition and attracts many of the finest cars from across the country. Click here to watch the video of Rhys Millen drifting through the streets of Reno to deliver the Barrett-Jackson Cup trophy. Judges Bobby Alloway, Pete Chapouris and Bob Millard chose 25 cars from the three-day Barrett-Jackson “Show-N-Shine” in downtown Reno. The vehicles were displayed in the Reno-Sparks Convention Center on Saturday before the top five finalists advanced to a ceremony on the Barrett-Jackson Auction block. The Barrett-Jackson Las Vegas auction will be held Sept. 24-26, 2015, at the Mandalay Bay Event Center. Coverage of the Las Vegas auction will be broadcast in live high-definition TV on Velocity and Discovery. For more information on becoming a bidder, follow the link to . This much-talked-about A.O. Smith-bodied 1967 Chevrolet Corvette 427 Convertible (Lot #617) sold for $214,500. RENO, Nev. – Aug 9, 2015 – Barrett-Jackson, The World’s Greatest Collector Car Auctions®, once again delivered an action-packed auction during the 3rd Annual Hot August Nights Auction presented by Barrett-Jackson in Reno Tahoe, Nevada, Aug. 6-8. Barrett-Jackson’s Reno Tahoe auction included the sale of 232 vehicles and over 400 collectible automobilia pieces totaling more than $9.5 million in sales (unaudited) at an astonishing 100 percent sell through rate. Barrett-Jackson also shattered automobilia records with a 36 percent increase in sales over 2014. Guests filled the auction arena peaking attendance at over 40,000 and surpassing the Reno-Tahoe record for single-day attendance on Friday. In addition, the eclectic docket of collector cars attracted the most bidders in the Hot August Night Auction’s three year history. Included in the auction excitement was the 3rd Annual Barrett-Jackson Cup competition offering more than $100,000 in cash in prizes. On Wednesday professional stunt-driver Rhys Millen drifted through the streets of downtown Reno to deliver the Cup trophy in true Barrett-Jackson style. Click here to watch the video. Barrett-Jackson continued its dedication to organizations that support charitable endeavors and the men and women who have bravely served our country. With five charity lots, Barrett-Jackson raised over $400,000 for deserving organizations including Special Operations Warrior Foundation, Ride 2 Recovery, The Foundation for Exceptional Warriors, High Fives Non-Profit Foundation and Transforming Youth Recovery. Properly restored to better than original condition, this MG is finished in black and features a contrasting crimson interior. The paintwork on this car is exceptional and is highlighted by fully refinished chrome work throughout the car. The large grill has red louvres and is surrounded by the Lucas lamps, and a badge bar with both the horn and an additional fog lamp. Inside the cockpit, the mostly original red interior is in great condition for its age. Period Jaeger gauges adorn the wood dash, and all switches and gauges work as they should. Other equipment included; boot cover, hand crank, Moss nerf bars, owners manual, Tompkins steering box, tonneau cover, tools, Yeager water temp gauge, and alloy valve cover. Pop either side of the bonnet and you will find the 1.3 liter, overhead valve, 4 cylinder engine that produces 54 horsepower. This particular features recent service work including a new clutch. The 19" wire wheels are tuned right and roll nicely with period Dunlop rubber, both working well with the suspension to keep this MG planted firmly. Easily the finest driving TC we ever had. Rarity and quality are driving the collector car market right now, so dont miss this 49 MG TC, as it hits both marks dead on. A thorough detail has just been performed to make sure that it meets our strict standards. Please give us a call to make an appointment to see how nice this MG really is, down to The Last Detail! RENO, Nevada – Aug. 6, 2015 – Barrett-Jackson, The World’s Greatest Collector Car Auctions®, announced today that world-renowned auctioneer, Joseph Mast, will lead a team of state and international championship auctioneers beginning with the 3rd Annual Hot August Nights Auction presented by Barrett-Jackson in Reno Tahoe, Nevada, Aug. 6-8. Mast, who has worked as an auctioneer for Barrett-Jackson Auctions since 2008, will lead a group of world-class auctioneers, including many who have worked at past auctions of the company. A native of Ohio, Mast graduated from Missouri Auction School in 2001. His early auctioneer career focused on estate, chattel and real estate, and later grew to include auto auctions. He has been a consistent finalist at the International Auctioneers Championship (IAC) and is the youngest auctioneer to win the IAC Championship. 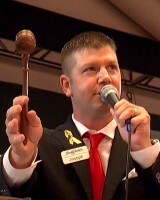 In addition to other championship titles, Mast currently sits on the Board of Directors of the National Auctioneers Association. Building on his popularity, Mast was recently featured as a grocery store clerk in GEICO’s “Did You Know” commercial series. The Mast Auctioneer team for the 3rd Annual Hot August Nights Auction presented by Barrett-Jackson will consist of world-class and state champions, many of whom have extensive experience at Barrett-Jackson Auctions. Coverage of the 3rd Annual Hot August Nights Auction presented by Barrett-Jackson will be broadcast in LIVE, high-definition TV on Velocity and Discovery. For more information on becoming a bidder, follow the link to . Professional stunt driver Rhys Millen smokes the tires on his 2015 Hellcat in downtown Reno as he delivers the Barrett-Jackson Cup to Hot August Nights. RENO, Nevada – Aug. 5, 2015 – Barrett-Jackson, The World’s Greatest Collector Car Auctions®, and Pennzoil-sponsored stunt driver Rhys Millen delivered the Barrett-Jackson Cup to Hot August Nights today in honor of the 3rd Annual Hot August Nights Auction in Reno Tahoe, Nevada, Aug. 6-8. Millen drifted a yellow 2015 Dodge Hellcat on a closed-road course through downtown Reno, where he personally delivered the coveted Barrett-Jackson Cup trophy. The Barrett-Jackson Cup has become one of the most anticipated custom car competitions boasting one of the hobby’s richest purses of more than $100,000 in cash and prizes. With the help of Hot August Nights, the City of Reno and the Reno Police Department, Rhys piloted this 707 horsepower yellow 2015 Dodge Hellcat through downtown Reno, drifting past several iconic Reno landmarks, including the famous Reno Arch and Barrett-Jackson Cup sponsors Eldorado Resort Casino, Silver Legacy Resort Casino, Harrah’s Hotel & Casino and Circus Circus Hotel & Casino. For a video of the drifting excitement, click here. Rhys will be also be on-site to sign autographs for fans during the 3rd Annual Hot August Nights Auction presented by Barrett-Jackson. His autograph session will be held in the Vendor Marketplace on Thursday, Aug. 6, from 11:00 a.m. until noon. In addition to Rhys lighting up the streets of Reno in a Hellcat, Barrett-Jackson has two 2015 Hellcats crossing the block at No Reserve on Saturday, August 8 at the 3rd Annual Hot August Nights Auction. One in Billet Silver and the other in Sublime Green Pearl, both 2015 Dodge Challenger Hellcats feature the lauded 6.2-liter HEMI V8 engine. For more information on becoming a bidder, follow the link to . This limited edition SL500 is beautifully finished in the Glacier White and is complemented by the Ash Leather interior. The exterior of this stunning SL is nearly flawless and is accented by the AMG wheels, setting off the cobination well. The Nappa Leather interior was meticulously cared for and will continue to wrap the new owner in comfort for years to come. This Mercedes comes loaded up with items like a Auto Climate Control, Cruise Control, 6 speaker Acoustimass Stereo with CD Changer, 10 Way Power Heated Seats, Tele Aid Emergency Calling, and Xenon headlights. This 2001 SL500 retains the venerable all aluminum 5.0L V8 that produces 302 horsepower and 339 foot pounds for torque. Driving this SL is simply a dream thanks to recent service, always done by a factory authorized dealer. This SL starts, stops, runs, and drives just as well as it did when new and comands attention anywhere it goes. Turn the key, drop the top, and watch the needle climb as you take off for that well deserved Sunday drive. A thorough TLD detail has just been performed to make sure that this car meets our strict standards. This low mileage SL500 is as clean as they come and ready to take on the road, so stop by our showroom and see how nice this SL really is, down to The Last Detail. Exceptionally finished in Jet Black with a matching black leather interior, this Anniversary Corvette is ready for a night on the town! The exterior is highly polished and the trim, lenses, and side view mirrors are also in great shape. All window glass is in exceptional condition as well and the hideaway headlights, which function as new. The black leather has been well cared for and it shows. The matching door panels, dash, and carpet all follow suit as well. The fully functional gauges and their lenses are crystal clear and are highlighted by the leather wrapped steering wheel. Features include rear defroster, tilt/telescopic steering wheel, power windows, T-Tops, A/C, and AM/FM cassette with rear speakers and power antenna. Power comes from the optional L-82, 350 V8, thats backed by a 4 Speed transmission and produces 220 horsepower. Power steering, power 4 wheel disc brakes, Positraction, Raised white letter tires and the iconic aluminum wheels round out the package. Driving this Vette is a blast! Simply flick the key and the small block roars to life. Pop out the T-Tops, turn on the tunes, and go for that well deserved Sunday cruise. A through TLD detail has just been performed to ensure that this car meets our strict standards. Stop by our showroom to see how nice this Corvette really is, down to The Last Detail. These four vehicles will cross the block in Reno Tahoe in support of veterans and their families. RENO, Nevada – July 31, 2015 – Barrett-Jackson, The World’s Greatest Collector Car Auctions®, is continuing its support of charities benefiting United States veterans and their families with the auction of four vehicles during the 3rd Annual Hot August Nights Auction in Reno Tahoe, Nevada, August 6-8, 2015. Barrett-Jackson has raised nearly $84 million over the years for numerous charities and will continue at Hot August Nights with its support of the Special Operations Warrior Foundation, Ride 2 Recovery, The Foundation for Exceptional Warriors and the High Fives Non-Profit Foundation. Craftsman, an official content partner of Barrett-Jackson, is donating a 1965 Comet Caliente (Lot #3001) to benefit the Special Operations Warrior Foundation, providing financial assistance to severely wounded and hospitalized special operations personnel as well as to the families of personnel who lost their lives in the line of duty. This ’65 Comet Caliente was custom modified and restored for performance racing. Performance features include a Roush 427-R engine with an EFI stack injector and a T-56 6-speed transmission. Steve Davis, president of Barrett-Jackson, is re-donating a 2014 Victory Cross Country 8-Ball Motorcycle (Lot #3002) to benefit Ride 2 Recovery, the same beneficiary when Davis purchased the motorcycle in January at the 44th Annual Barrett-Jackson Scottsdale Auction. Ride 2 Recovery supports Spinning® Recovery Labs and outdoor cycling programs at military and veterans affairs locations around the country to help injured veterans overcome obstacles. The motorcycle is painted to resemble the United States flag and is powered by the legendary Victory fuel-injected 106ci V-Twin engine with a 6-speed overdrive transmission. Bennington is once again donating one of its boats to benefit The Foundation for Exceptional Warriors. This pontoon boat is a 2014 Bennington Mahogany Luxury Boat (Lot #3003) and is top of its class in luxury boating. It is equipped with an 8.2 MAG engine, thru-hull exhaust, a sporty tower and an impressive sound system. Proceeds from the auction of this vehicle will assist in the healing process of the families and veterans of Special Operations Forces, those recognized for valorous action and those wounded in combat, regardless of era, by providing customized therapeutic recreational and sporting events to enhance their mental and physical health. Also crossing the block to benefit charity will be a 1957 Willys Jeep Wagon (Lot #3000), embodying all the charm of one of the first production SUVs. This vintage beauty will benefit the High Fives Non-Profit Foundation based in Truckee, California. The foundation supports the dreams of mountain action sports athletes by raising injury prevention awareness while providing resources and inspiration to those who suffer life-altering injuries. The money specifically raised with this auction will go towards the “Marines to the Mountains” program dedicated to bringing Marines injured in service to Squaw Valley for a once-in-a-lifetime skiing experience. In addition to the four charity auctions benefitting veterans and their families, a 1970 Toyota Land Cruiser FJ-40 (Lot #3000.1) is being auctioned in support of Transforming Youth Recovery. Created in 2013 by the Stacie Mathewson Foundation in Reno, Transforming Youth Recovery supports educators, parents and community members in helping students recovering from addiction thrive in the fullness of everyday life. This Land Cruiser features a straight-6 engine, 4-speed manual transmission, factory winch and tow package, rear side seats and 4-wheel drive. Coverage of the 3rd Annual Hot August Nights Auction presented by Barrett-Jackson in Reno Tahoe will be broadcast in live, high-definition TV coverage on Velocity and Discovery. For more information on becoming a bidder, follow the link to .